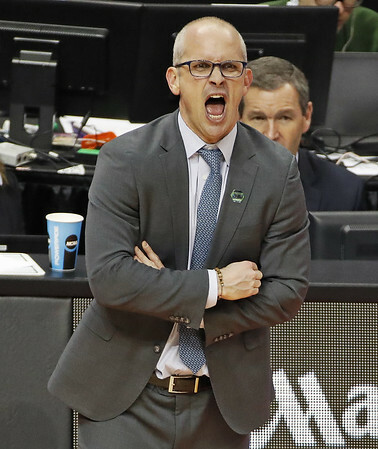 Danny Hurley is on the verge of becoming the next coach of the UConn men’s basketball team. According to a source, Hurley met with UConn officials Monday and is deciding whether or not to accept the Huskies’ offer. A Rhode Island-based news website, golocalprov.com, reported Monday night that Hurley had already accepted the UConn head coaching position and that the terms of his new contract had been finalized. Hurley was 112-82 in six years at Rhode Island, winning 51 of those games in the last two years. Hurley, 45, was also the coach at Wagner for two seasons before taking over at URI. A native of Jersey City, New Jersey, Hurley is a Seton Hall graduate who comes from a well-known basketball family. His father Bob was a longtime high school coach in New Jersey and his brother Bobby is a former Duke point guard who is currently the coach at Arizona State. Kevin Ollie was fired by UConn March 10 after six years at the helm. Officially, the school, in its words, has “initiated disciplinary procedures to terminate the employment of [Ollie] for just cause” which could absolve UConn from paying Ollie a $10 million buyout. ESPN reported that in addition to UConn, Hurley met with Pittsburgh officials about the Panthers’ coaching vacancy on Monday as well. Hurley signed a contract extension with the Rams that was announced in May 2017 that runs through the 2023-24 season. It pays him, in total compensation, just over $1 million per year. Hurley’s contract with Rhode Island calls for a $1.5 million buyout be paid to the school should he take another Division I head coaching position. The new UConn coach will have to replace a number of spots on the roster, including at least one incoming freshman. UConn agreed to release Richmond, California point guard James Akinjo from his National Letter of Intent Monday. Akinjo had requested to be released not long after the school announced it was parting ways with Ollie. A 6-foot standout at Salesian Prep, Akinjo is ranked by most recruiting services among the top 75 players in the nation. UConn has also received letters of intent for its Class of 2018 from 6-7 Emmitt Matthews of Tacoma, Washington, and 6-9 Lukas Kisunas of Lithuania. Posted in New Britain Herald, UConn on Tuesday, 20 March 2018 20:04. Updated: Tuesday, 20 March 2018 20:07.